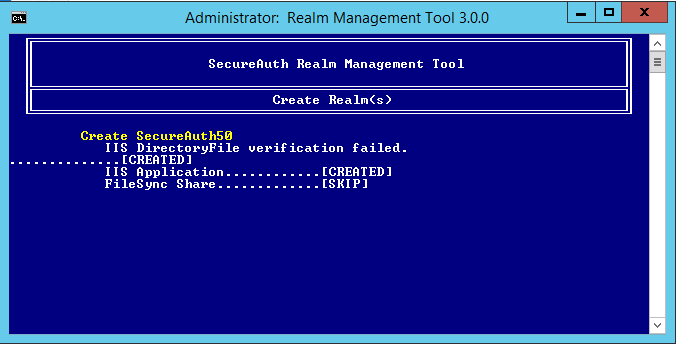 Description: When creating a new realm from an existing template, it shows that the "IIS DirectoryFile Verification failed" message on the Realm Management Tool. Cause: The realm that is being used as the template is being used by another process, therefore not allowing access to the tool to create the full directory file of the realm. There can be a number of different issues that may be causing this issue. Anti-Virus scanners and the IIS warm up tool are common applications that can be using the directory files. Using the IIS warm up tool, because it hits every realm on the appliance, causes IIS to lock certain files once the realm is opened up. This causes the Realm Management Tool to not be able to copy over certain files. Resolution: Turning off the IIS warm up tool so the realm does not get hit, therefore IIS will not lock certain files when the realm is created. Disabling the warm up tool will make the initial request slightly longer, but if we were to adjust the Idle Time-out to zero minutes in the application pools in IIS, it will make it so the worker process will remain idle instead of shutting down. If there is an Anti-Virus, adjust the scans so it avoids to scan the D drive all together.